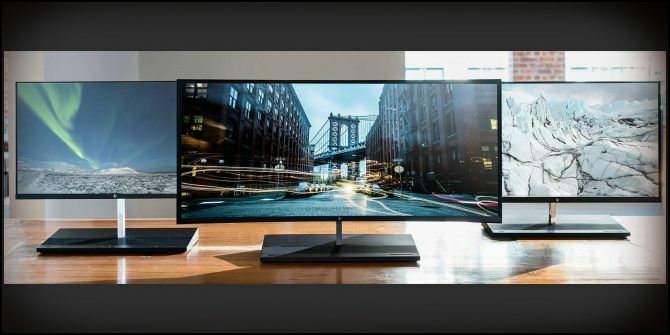 HP has launched a new all-in-one PC with a major difference: you can easily switch out the monitor for another one. The new PC, called the EliteOne 1000, has a wedge-shaped base containing most of its hardware components. The base can be easily opened to swap components out. But the most unusual feature is clearly the upgradable all-in-one display. If you’re thinking of grabbing that aging 32″ HDMI TV How to Get a Smart TV for Cheap With an HDTV How to Get a Smart TV for Cheap With an HDTV It's better to stick with a regular HDTV, and turn it into a smart TV with specialized gadgets. Here are the best options to accomplish that. Read More and delicately balancing it on the EliteOne’s stand, you’d be mistaken. Unfortunately, monitor upgrade options are limited to small number of HP-made devices. Regardless, it does allow for a level of customization previously unseen in all-in-one PC solutions. You might start out with a 23.8″ 1080p touchscreen Computer Monitors For Gaming: How Do You Choose The Right One? Computer Monitors For Gaming: How Do You Choose The Right One? Read More … but then swap that out for 34″ non-touch curved WQHD screen, just because you can. At the time of writing, there are just three screens to choose from, but more variations are set to arrive in the future. Currently available are the aforementioned 23.8″ 1080p touch or non-touch 18 Essential Touch Gestures in Windows 10 18 Essential Touch Gestures in Windows 10 Touch gestures are like keyboard shortcuts for your touchpad and touchscreen. And with Windows 10, they have finally become useful! We'll show you how to access the full potential of touch gestures. Read More , the 27″ UHD (4K, or 2160p), and the whopping 34″ curved WQHD (1440p). The all-in-one PC packs a decent punch, too. The EliteOne 1000 can come with up to an Intel Core i7, 32GB DDR4 RAM, and a massive 1.5TB SSD. The 23.8″ model will set you back $1,259, while the 27″ model retails for $1,499. The 34″ model is currently unreleased, and there is no indication towards its retail price at release (I’m confident it won’t be cheap!). The major downside to the EliteOne 1000 series is the lack of a dedicated graphics card. Furthermore, you cannot add one in. So while the monitor and other component are easily swapped out, any graphics heavy activity will rely solely on the Intel Core i7 integrated graphics. And while integrated graphics have improved drastically in recent years, they’re simply not powerful enough for certain GPU intensive activities, such as video editing. Would you like one of these at work? Or do you prefer your trusty laptop or desktop? Is the screen-swapping feature just a gimmick? Let us know your thoughts below! Explore more about: Hardware Tips, PC.